My hubby and I are celebrating our 11 Year Anniversary at the end of this month. It has become increasingly difficult to go out to eat with our crew. Between trying to find a sitter, and everyone’s food allergies I have all but given up. We began the tradition of having date nights at home a long time ago. I would cook us a fancy dinner and we would rent a movie. It is nice just to enjoy an evening at home with some kind of food that isn’t chicken nuggets. These stuffed artichokes take some time, but very little effort to put together. They are so mouthwatering and savory! The whole house smelled so wonderful! I love that each one is a self contained portion. These are such a great appetizer! This restaurant quality appetizer will wow any crowd. Boil in a large pot of salted water for 40 minutes or until tender. While artichokes are boiling, saute onions and garlic in 1 tbsp of olive oil until tender. Remove from heat and stir in bread crumbs, oregano, and cheese. When artichokes are tender allow to drain upside down for 5 minutes. Gently pull the leaves back and spoon in stuffing. 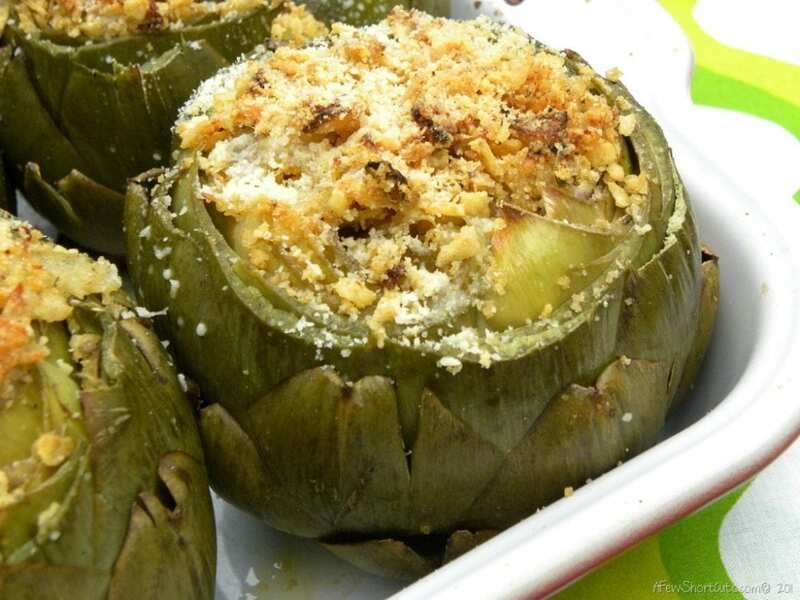 Place stuffed artichokes in a casserole dish and drizzle with olive oil and sprinkle with some more Parmesan cheese. Cover with foil and bake for 20 minutes at 400 degrees F.
Remove foil and bake another 5 minutes. 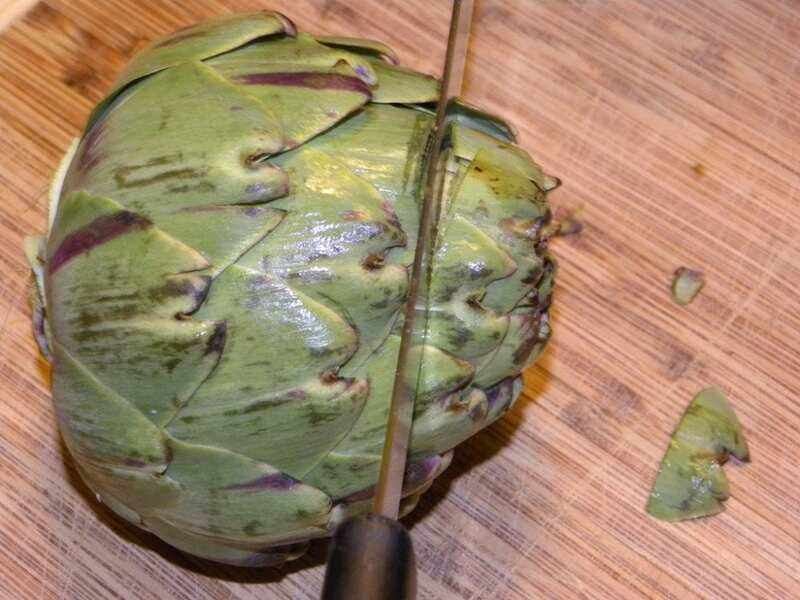 Start by cutting the stem off of a fresh artichoke. 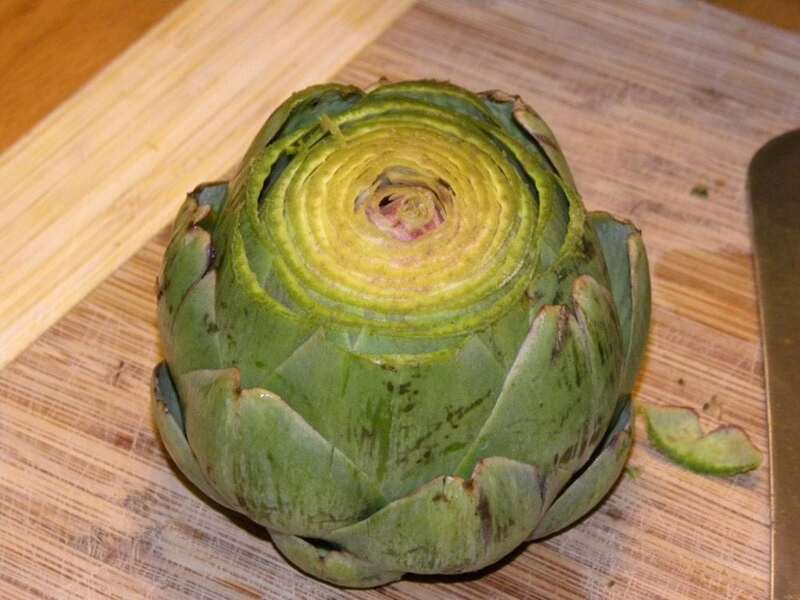 Then you are going to cut about 1/2 –3/4 of an inch off the top of the artichoke. Place cut artichokes in a bowl of lemon water until you are ready to boil. 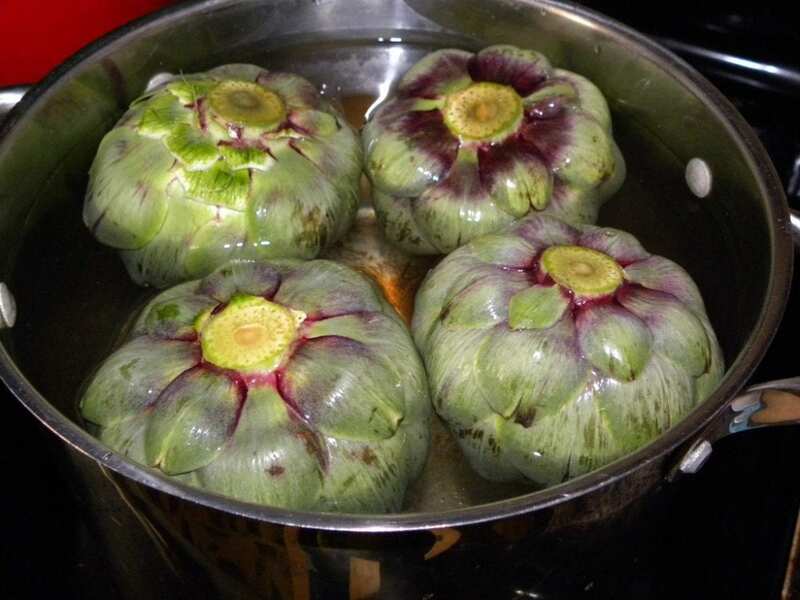 Boil artichokes in a large pot with just enough water to cover for 40minutes or until tender. 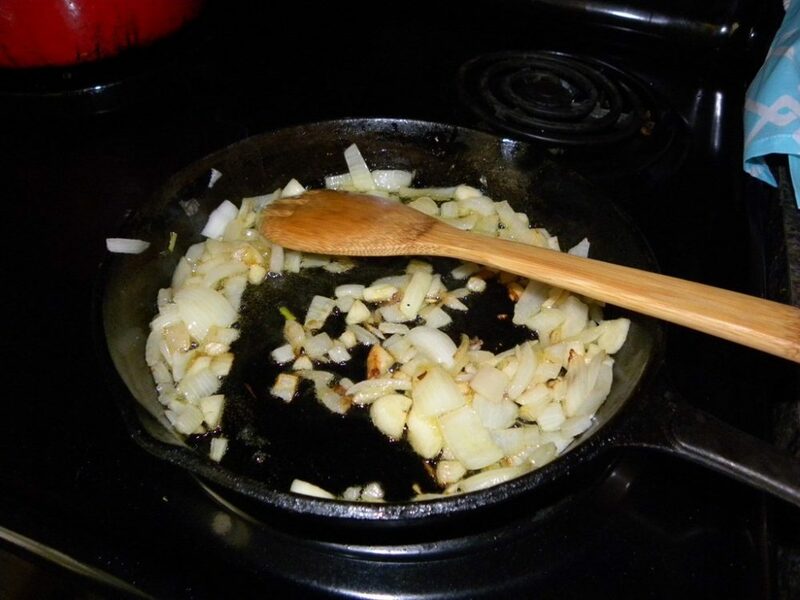 While they are boiling heat onion and garlic in a skillet with a tablespoon of Olive Oil. 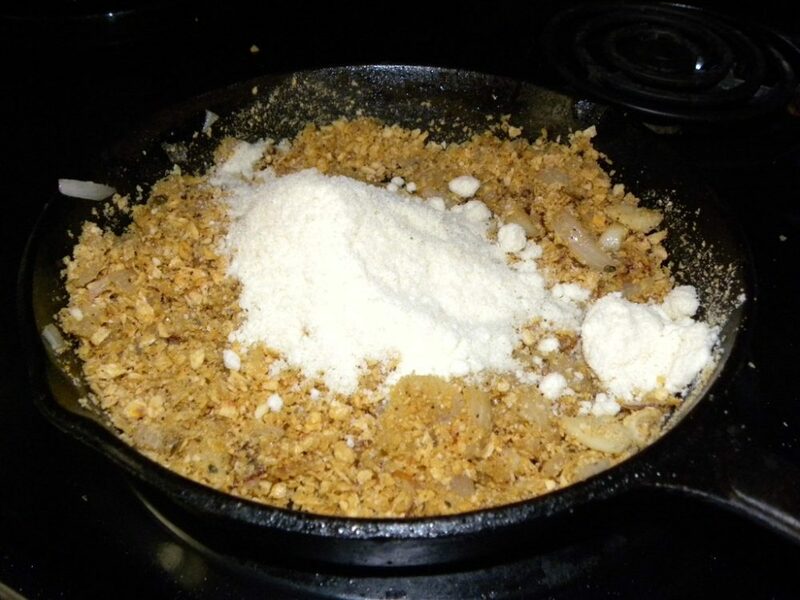 Once the onions start to brown add in breadcrumbs, oregano, and cheese. Remove Artichokes from pot and allow to drain upside down for a few minutes to make sure all the water is out. Carefully pull the artichoke leaves apart and spoon stuffing into the artichoke. 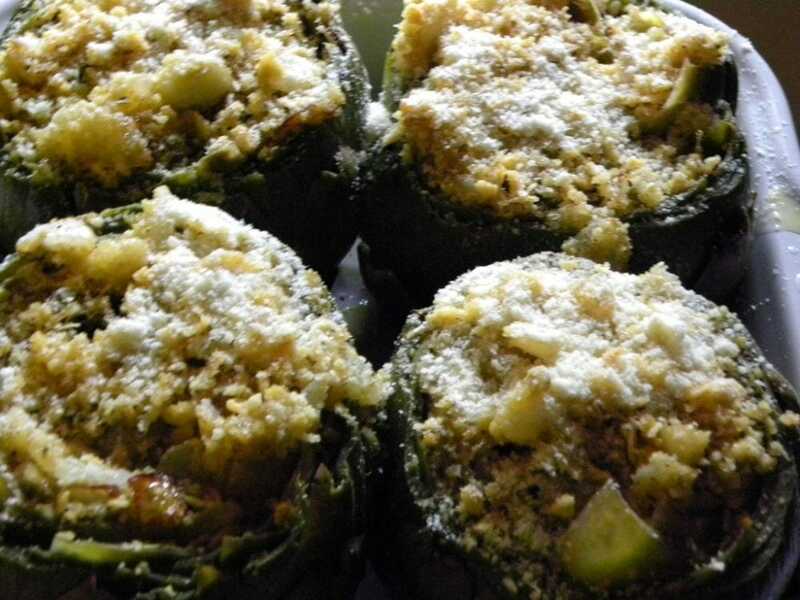 Place in a baking dish and drizzle with olive oil and some more grated Parmesan Cheese. Cover dish with aluminum foil and bake at 400 degrees for 15 minutes. Remove foil and bake for another 5 minutes. WOW!! Those sound amazing!! We love date nights in! Better food – more leftovers – and all-around more relaxing!! Happy anniversary!! This looks so yummy! I love artichokes! OK, this may be a dumb question, but how on earth do you EAT them? So not to sound silly but is everything on the “finished product” edible? 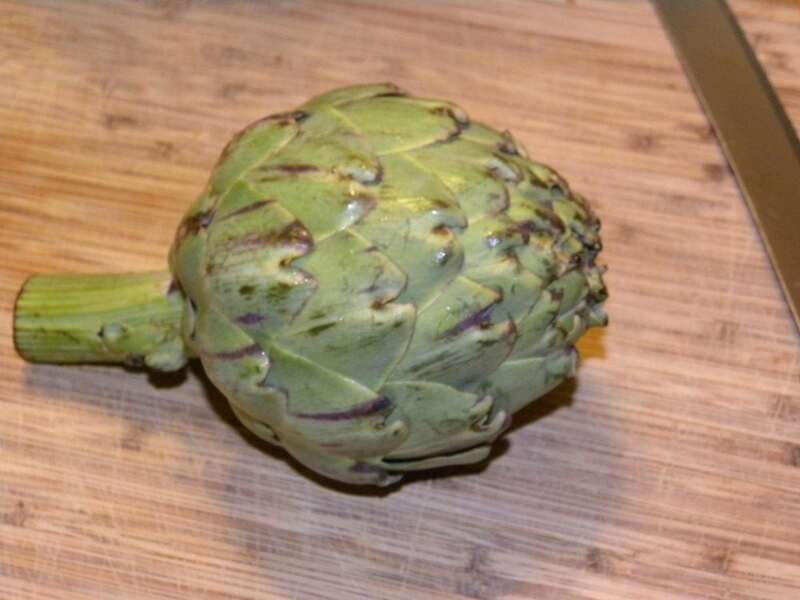 I have had artichoke in items, but I have never prepared or just eaten one. Thanks and Happy Anniversary! You pull the leaves off and scrape the inside of the leaves with your teeth. You don’t want to eat the choke, that is the inside center. But you can enjoy the heart. Look up on google what the choke is so that you can see.